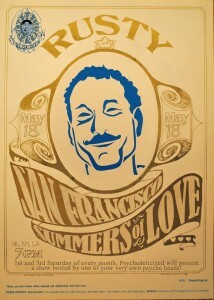 This Saturday, May 18, Psyche Power Hour will feature Rusty’s first show – San Francisco: Summers of Love. It’s an hour long musical journey to the City by the Bay during the peak of psychedelia. Be there for the love-in: 7pm UK, NY & LA. 2nd Sat = Live Psyche Out!